Once you land, follow the Yellow signs towards Baggage Claim and get your checked bag. 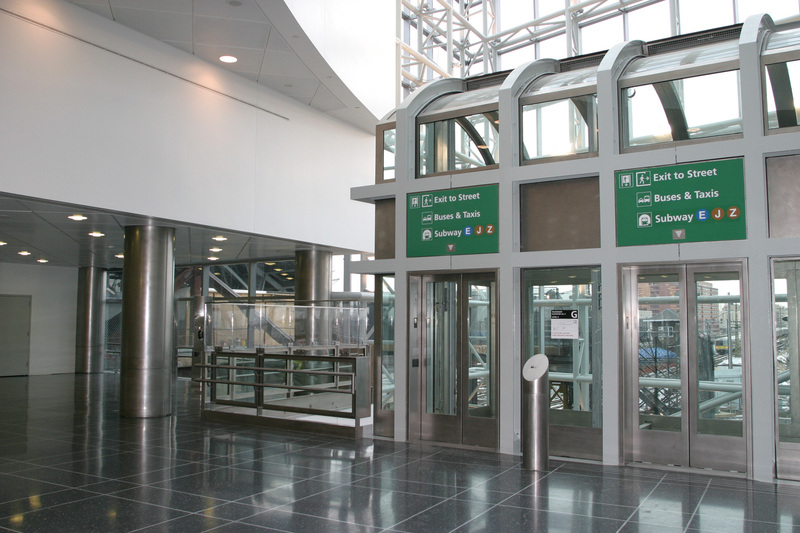 Then, head to the far right (as you enter the baggage claim area) and follow the Green signs up the escalators towards AirTrain. You’ll go up 2 sets of escalators, then a long walk. Take the AirTrain to Jamaica Station (NOT Howard Beach). It costs $5 to get out, so you’ll need a MetroCard + AirTrain ticket to do so. The machines take credit cards, and when you buy $20 (plus $1 for a new card), you get a $2 bonus. This will be enough to get back to JFK when your trip is over. Once you’ve got your MetroCard, exit the AirTrain area, past Tim Hortons on your left (grab a large double-double if you feel like it), and continue towards the E line (blue). It can be confusing because the LIRR is there, too, but follow the signs for E “to World Trade Center” (the train on the right, where everyone else is going). Now sit back & relax; you’ll be on this train for a while (for about 1/2 hour). Once you get off at 7th Ave, now the fun begins. In theory, exit the Southwest Corner then head away from Central Park (big empty space in the sky) down 7th and you’ll be at the hotel. But hey, this is NY, right? Instead, head up W 53rd St. to Broadway and see the Late Show w/ David Letterman at Broadway and W 53rd. Then make a left on Broadway and wheel your luggage into Times Square. When you get to W 46th you’ll be at the New York Marriott Marquis on your right. Don’t forget to look for a Walgreens or Duane Reade so you can pick up essentials after you check in. Of course, if you want the very easy (but pricier) version, get Uber. If you’re not yet using Uber, you can get $30 in free fare with this promo code. UberX, which is a plain car, will cost you $60 for JFK to Times Square, so you can get 50% off. Eric staying on the E train 2 more stops and get off in the back at 42nd Times Square stop will let you off at 43rd and 8th. You can walk up 3 blocks and turn right and be at the hotel. If you wanted to be really cheap and don’t have a lot of luggage I can get you there for the price of $2.50. Here is how I would do it. Take the Airtrain after getting off but take the train heading towards Howard Beach. Get off at the Lefferts blvd station where there is no fee to get off and go downstairs and take the Q10 bus a few stops to Lefferts Blvd A train station. It is a free transfer from the Q10 to the A train. Remember to ask the bus driver for a transfer if you don’t have a metrocard Get on train and get off at 42nd street. Total time would probably be about 2 hours in total. Ales make sure the air train is running. Last I heard it was going to be shut down for months. I just looked; there are Air Trains in other cities shutting down for repairs, but JFK is OK. Also, if it is shut down, the Port Authority provides shuttles. Getting off at 42nd & 8th does look like a shorter walk, but Google says it’ll take longer overall. Plus, who doesn’t like pulling luggage through Times Square??? That being said, if you get off at 42nd & 8th, you have to pass by Shake Shack to get to the hotel, so I may end up taking that route. Mmmmm…. Shake Shack. I jjust checked and airtrain from Newark is running again sicne July 03. Glad to hear it is running. Yeah the Airtrain at JFK is working fine. It is the Newark one that I saw wasn’t running. I just don’t trust Uber yet and while the public transit route is cheap, I just want to get to the hotel comfortably. My standby was suggested to me several years ago by Vinny… Dial 7! Trisha Lyn it is funny you mentioned that since we will be using Uber a couple of times on this trip. Deb and I are taking advantage of their sign up bonus.